This rock was gathered just a few miles from home. It's known locally, along with other rock found in the spillings of coal mines, as "Brookwood Stone." 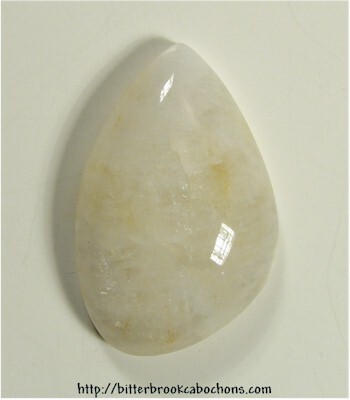 This cabochon doesn't look like the photo; the lower right portion has lots of small transparent areas that refused to reveal themselves "on camera." Very Quartz-y and impressive! Flat girdle; 30mm x 20mm x 8mm. Weight: 34.05 carats. Do you like Brookwood Stones? Click here to see all of the Brookwood Stones on the site! You are visitor number 33 to this page this year.